Low battery indication : The is display when the battery Voltage is below 7.2V. power off mode. Push button or run switch, auto power off disable. Accessories Test leads, Carrying Case, Battery installed, User's Manual. Operating Temperature 32 ~ 104°F (0 ~ 40°C), Humidity < 80% R.H. Display 3¾ digit LCD with a max. Reading of 3999. Battery type 9V zinc ~ carbon battery. 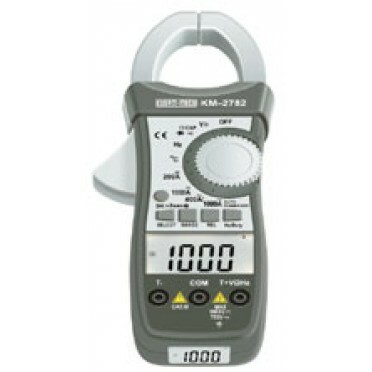 Features & Specifications :Digital Dual Display Clampmeter Model KM&nbs..